...because it's that time of the year when we head off to New Zealand to catch up with friends and family. This trip is particularly needed as the whole country has been affected by the disaster in Christchurch, and the Kiwi is feeling very far from home at the moment. All of our friends in the city are safe but there are very few New Zealanders who won't know someone affected by what has happened. I'm sorry about the lack of posts over the past couple of weeks. Real life has intervened and I didn't manage to finish off a report on the Freeman's Farm game that Eclaireur and I played last December. 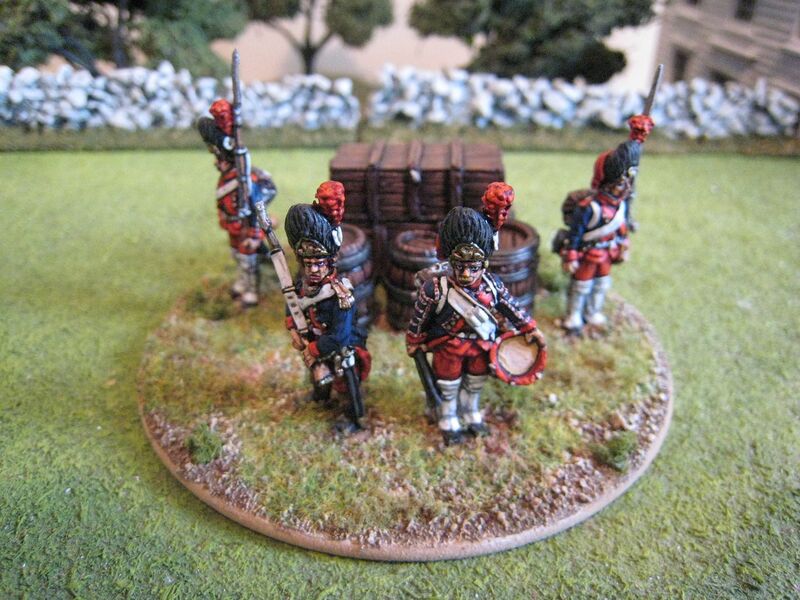 That game was undertaken ostensibly for us to take photos for the forthcoming second edition of Eclaireur's "British Grenadier!" rules, although I confess that we got carried away with the game and probably didn't take as many photos as we should have done! 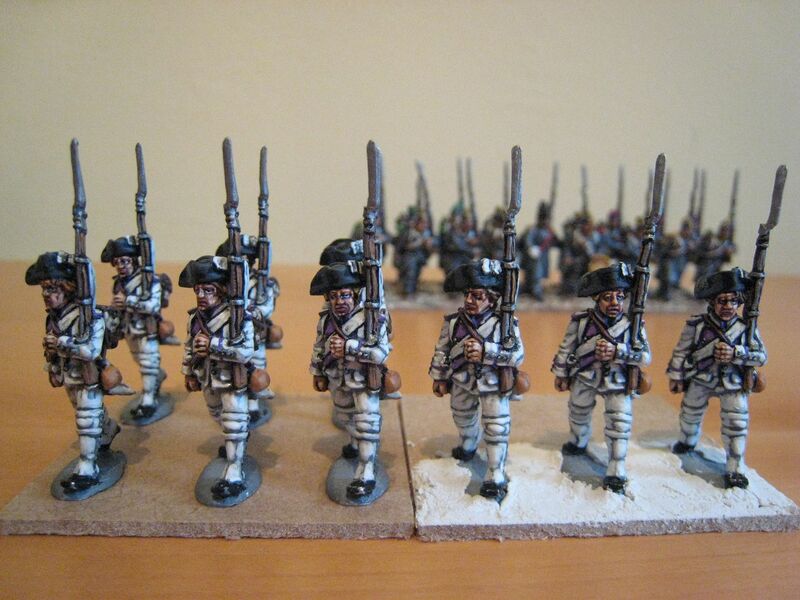 Anyhow, the photos above show current wip - the French Gatinois regiment for the AWI and my first Old Guard unit for 1815 (specifically the 4th Regiment of Chasseurs). 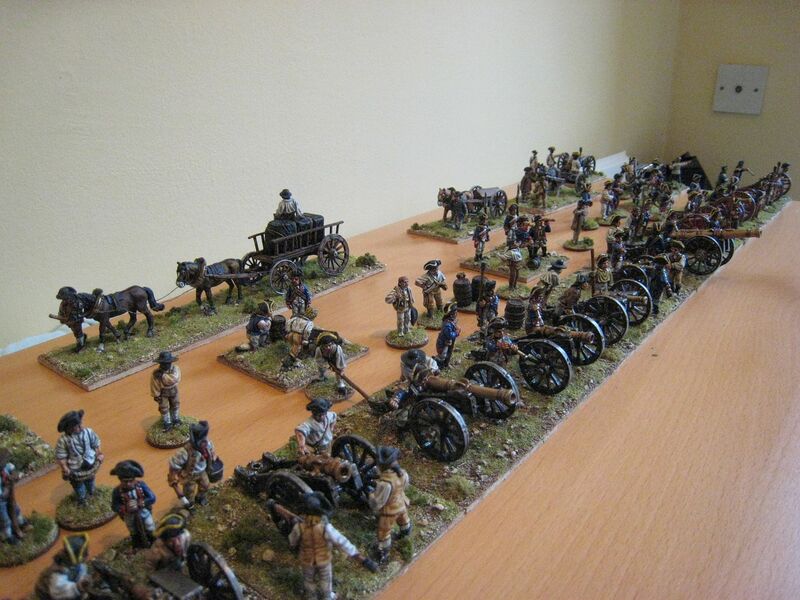 I have also been finishing off and basing some of my Dixon ACW figures, a large number of which I painted in the summer of 2000. Those will appear when I return in March. We are spending a week in New Zealand, mainly in Auckland and then on the west coast of North Island where we will be attending a wedding in Taranaki. We then head off for 2 weeks in Melbourne, where the Kiwi's sister lives. For me that will involve a meeting with the Eureka Miniatures mob and visits to as many of the surrounding wineries as I can fit in. We then head off to the countryside for more wineries and the opportunity for Hugo to run around in the sun. The poor chap has seen very little sunshine over the past few months and feeling green grass beneath his feet will also be a novel experience for him. 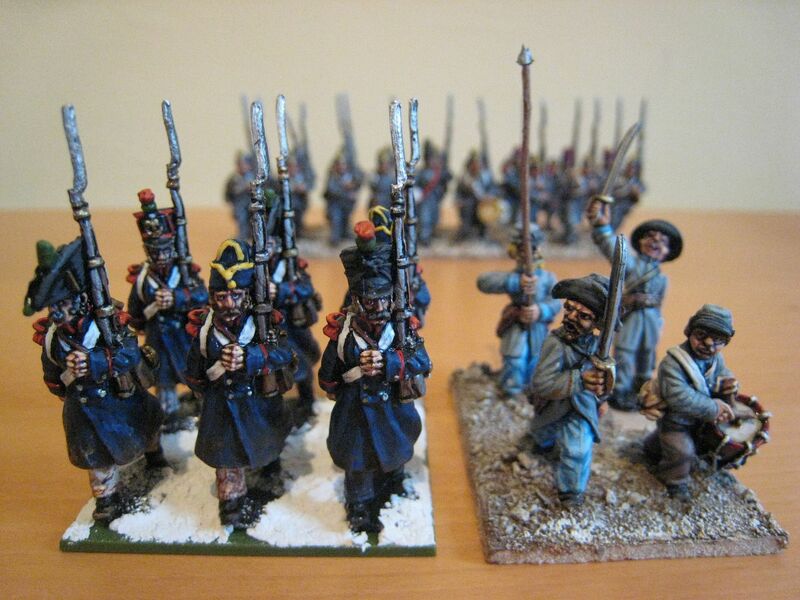 With two French infantry battalions completed it was time for a vignette! 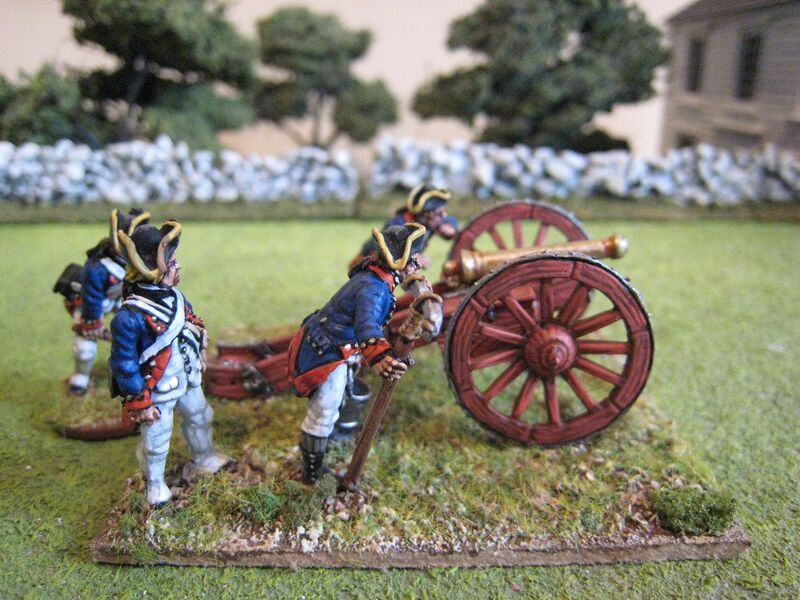 The bombardiers de la marine formed a navy unit created in the early 1680s to provide experienced sailors who could also handle the mortars in the bomb ketches that the French had developed to bombard port towns on the Barbary coast. In 1692 two companies were officially formed, situated in Brest and Toulon and comprising 50 men each. A few years later a third company was raised to be stationed in Rochefort. The three companies were part of the Artillerie de Mer and so remained under navy rather than army control, although there was a short period where the two branches of artillery were combined. 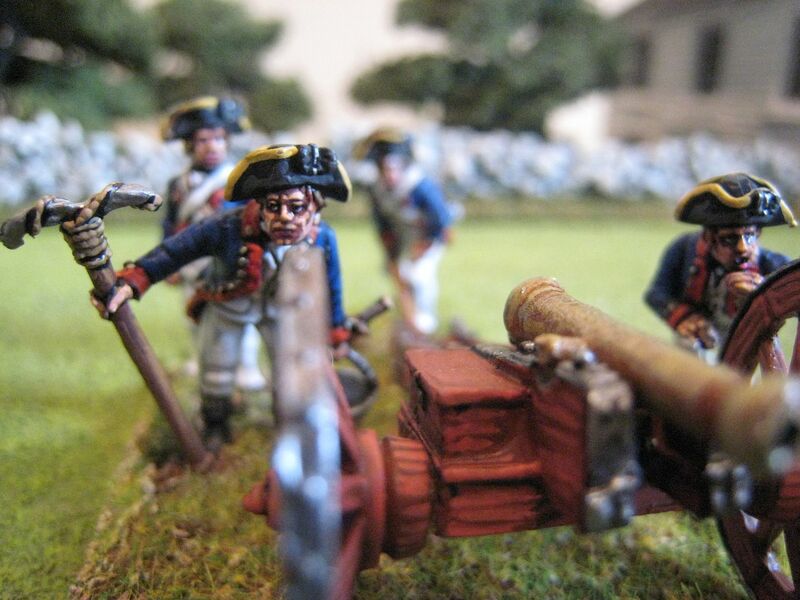 In 1764 the companies were reorganised into two brigades, of around 100 men each; however the old 3 company organisation seems to have been reinstated 10 years later. I have not been able to find detailed information about the campaigns that the bombardiers participated in, but assume that they were deployed wherever the French navy operated and they certainly arrived in America at some stage. 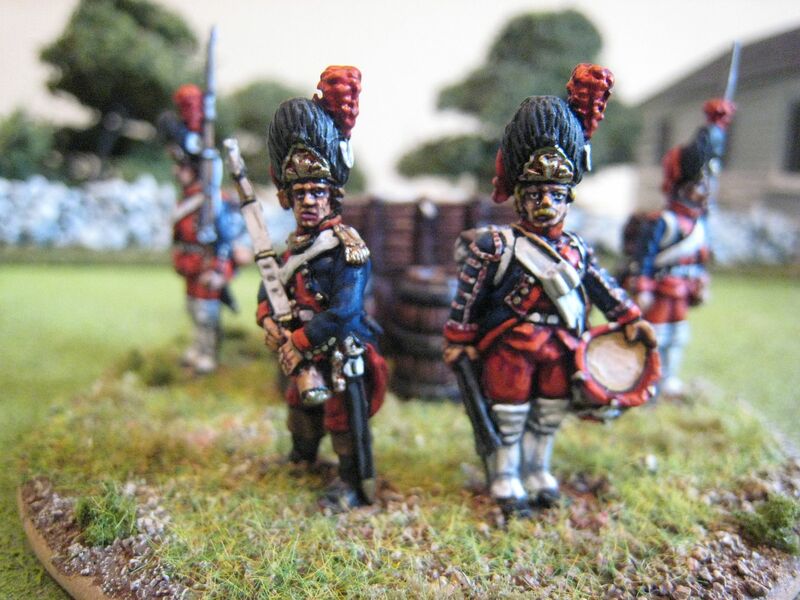 Followers of the Perry Miniatures range may recall that the French grenadier figures that were in the first release of French troops were sculpted with bags hanging off their bearskins. Alan Perry then said that this was a mistake and he was remastering the figures so they didn't have the bags. By this time I had already bought some of these figures and decided I wouldn't send them back to be replaced if I could find a use for them. The Osprey MAA has an illustration of the bombadiers which clearly shows a bag on the bearkin. So I decided to make a small vignette of the bombadiers guarding some stores or ammunition. This was also a way of using up the 2 grenadier figures from the standing infantry command pack that also had bags on their bearskins. The only part of the uniform that I suspect may be wrong for the bombadiers is the plume on the bearskin - this isn't present in the Osprey illustration. But, frankly, who cares and I quickly decided I couldn't be bothered to carve the plumes off. Out of the possible colours I thought red would look best, and to be honest I think the red plumes give the figures a bit of a "lift" anyway. I had no sources of information for the drummer, but thought it best to keep him in the dark blue coat and add the standard drummer's lace. The blue paints used were Foundry's "Napoleonic French Blue 65" palette, with an final subtle highlight of Foundry "Deep Blue 20 C". 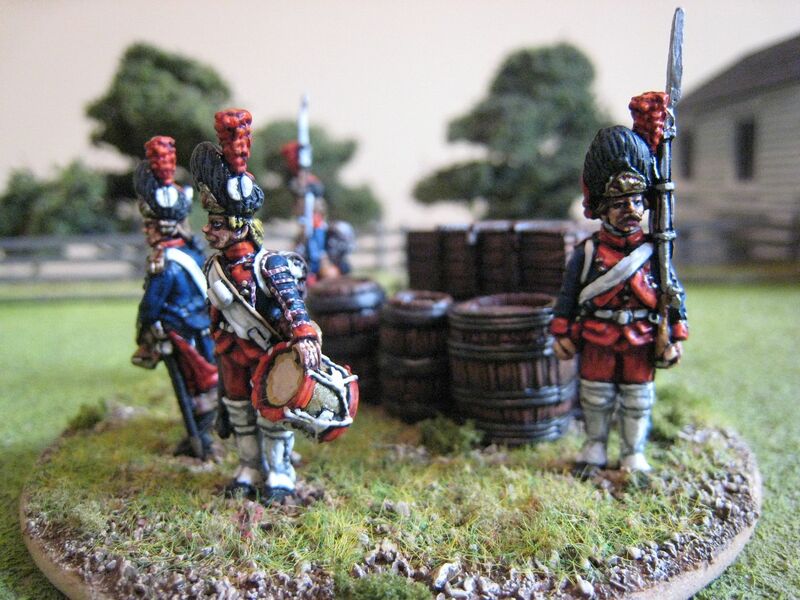 The woodwork on the barrels was painted with a base coat of GW "Scorched Brown" given a wash of Winsor & Newton dark brown ink, then highlights of Foundry "Spearshaft 13 A and B". The crates and barrels are from Warlord, save for the larger barrel which is Renedra. The Renedra barrel looks ok now it's painted, but I found the two plastic halves didn't fit together properly. The Warlord crates are resin - you get a variety of sizes in the pack. Only one of the crates seems to have anything resembling a lock (the silver bit on the topmost crate), although I suppose that may just be a bit of surplus resin. The round base is a drinks coaster that I bought with Peter Haldezos in Wellington! 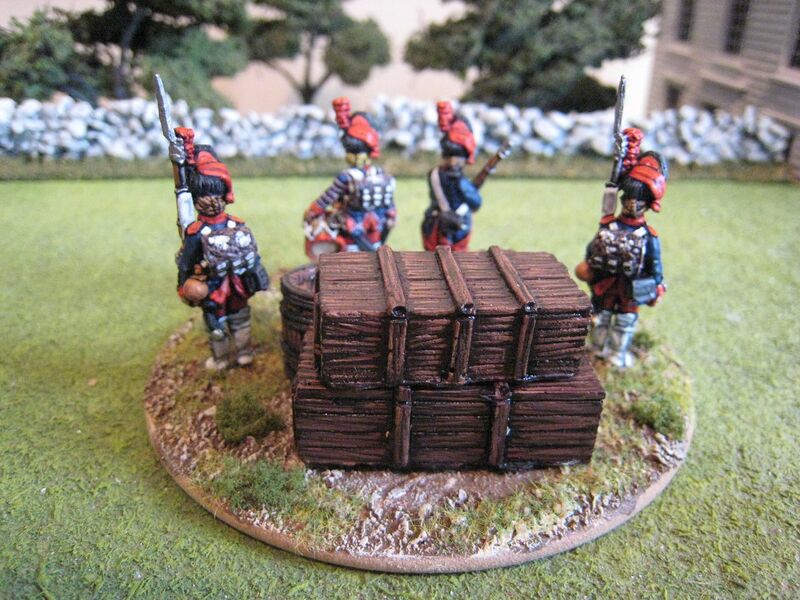 I have 4 of the standing grenadiers left over - if anyone can think of another use for them then please let me know, otherwise I'll just paint them up as more bombardiers! 4 figures. Painted January 2011. 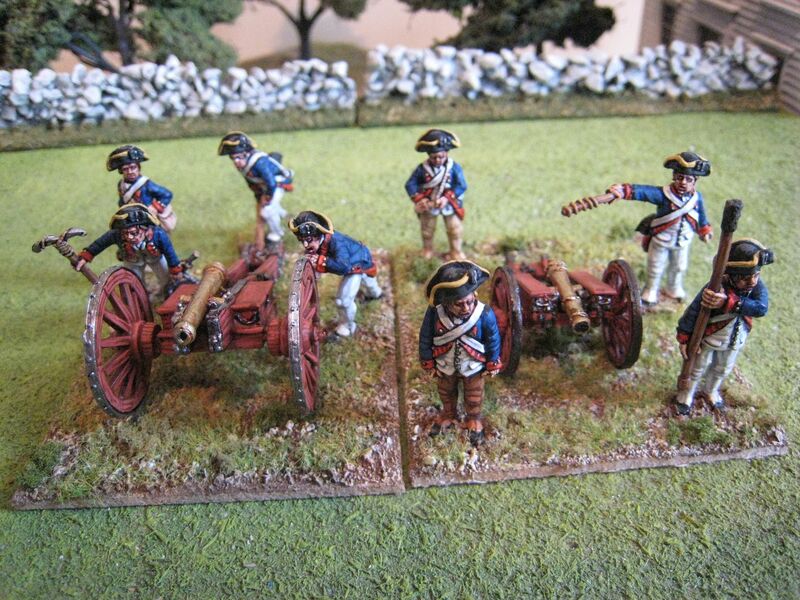 These are the last American artillery crews I will paint for some time. 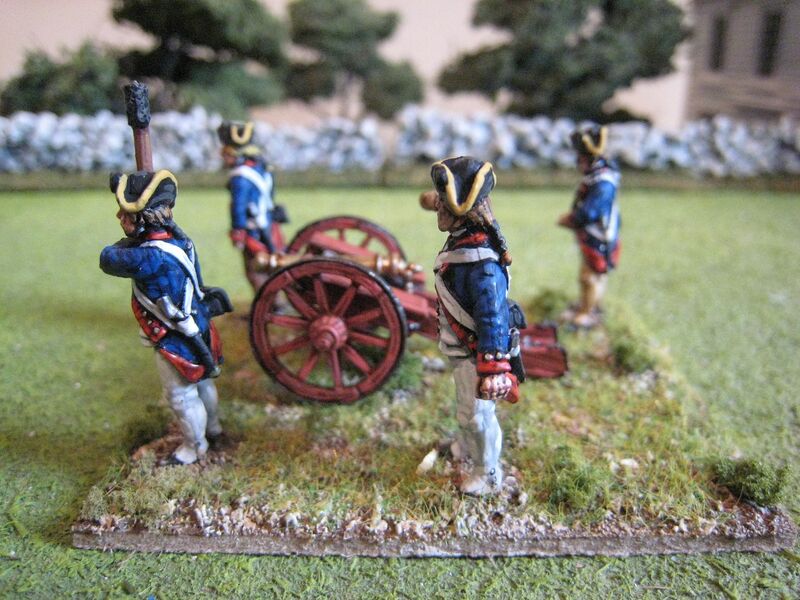 They are the 2 "standard" Continental artillery packs from Perry Miniatures (the other Perry packs can be found elsewhere in the "Artillery" label', save for the Rhode Island pack which in will worry about some other time). 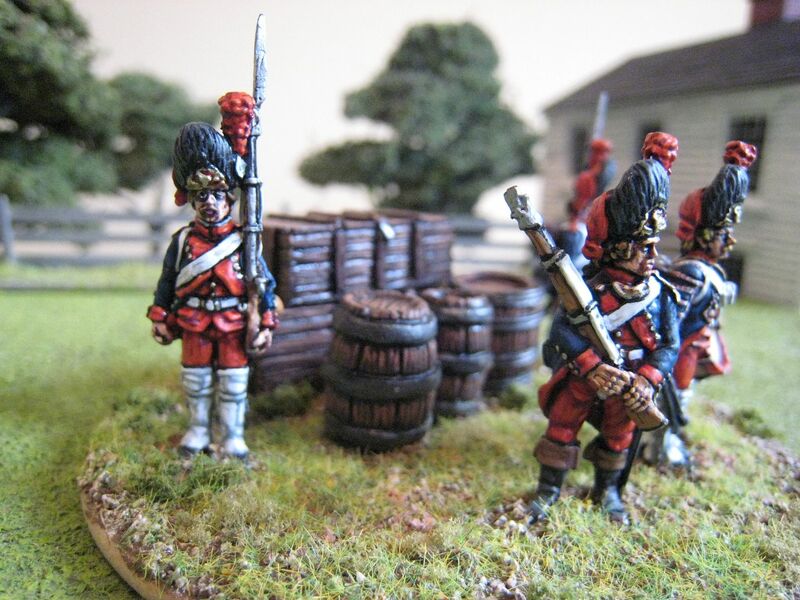 The figures are based on the same "dollies" that are used for the British SAratoga crews and so largely wearing gaiter trousers and carry bayonets. I thought the latter was a bit strange on American artillerymen - I'd be interested to know what readers think. None of the Foundry American artillery figures carry bayonets, incidentally. I painted the gunners themselves in standard artillery blue-faced-red coats with yellow lace on their hats. I gave a couple of the figures some buff and brown trousers to suggest that campaign dress look. 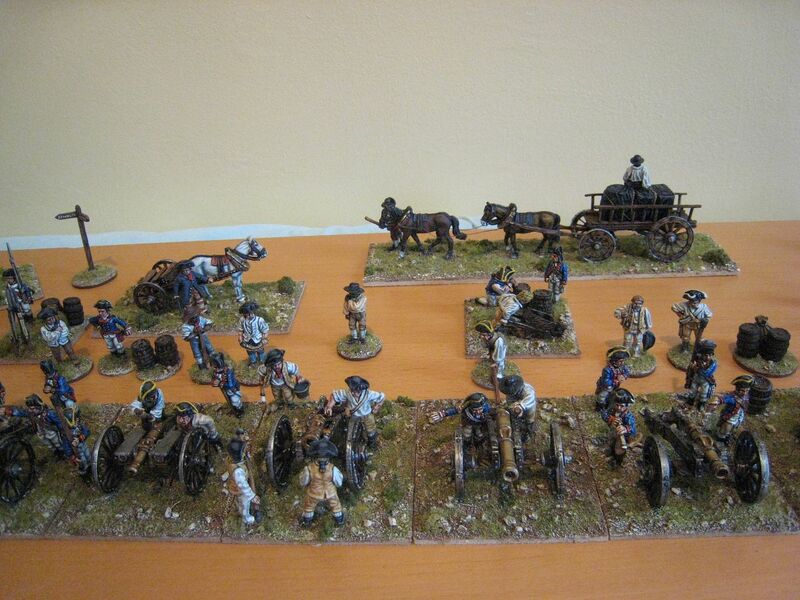 As these are my last American artillery pieces I thought I would get all the others out and see what they looked like all set up together (apologies for the unsophisticated nature of the pics). 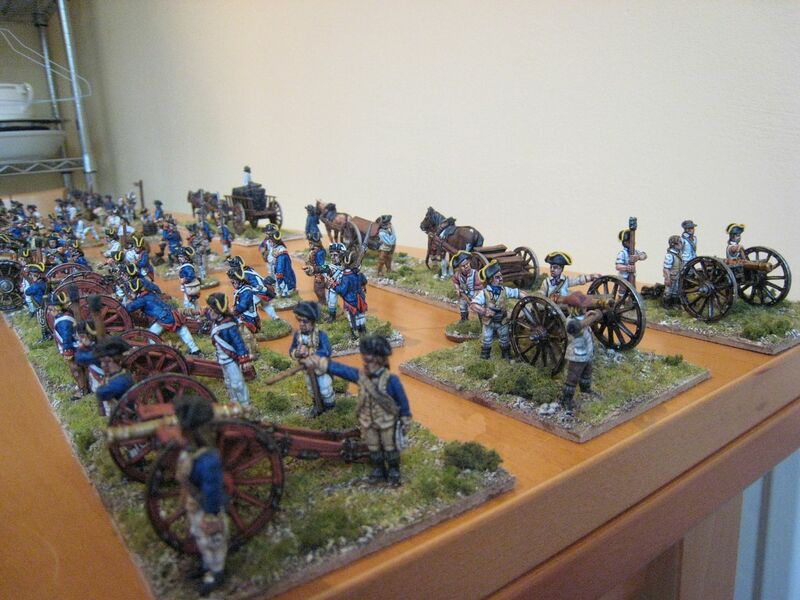 They just about fitted on the kitchen table, although I had to put the two Eureka "Molly Pitcher" guns along the flank. 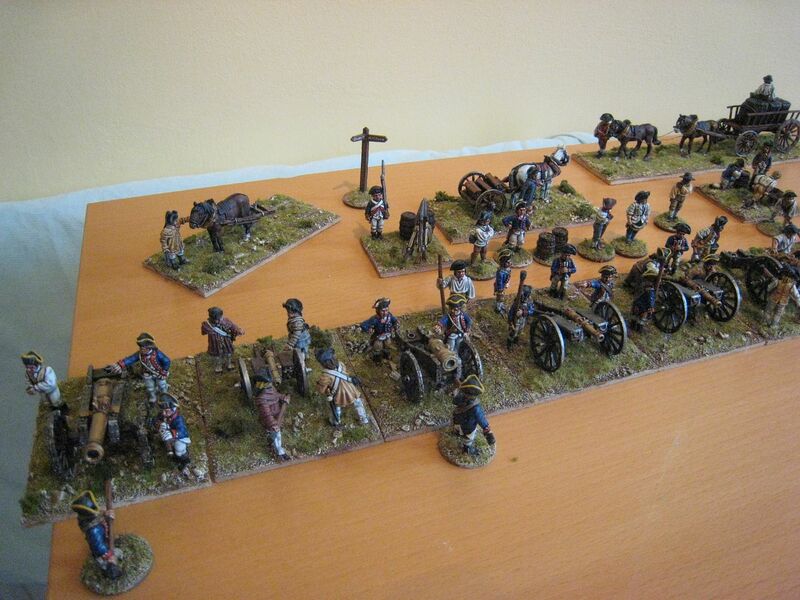 I have 17 artillery crews in all on the American side - this is way more than you need for most AWI engagements and, I expect, may exceed the total number of guns that were actually present in one or two of those engagements...Anyway, below are photos of my entire Continental artillery collection. 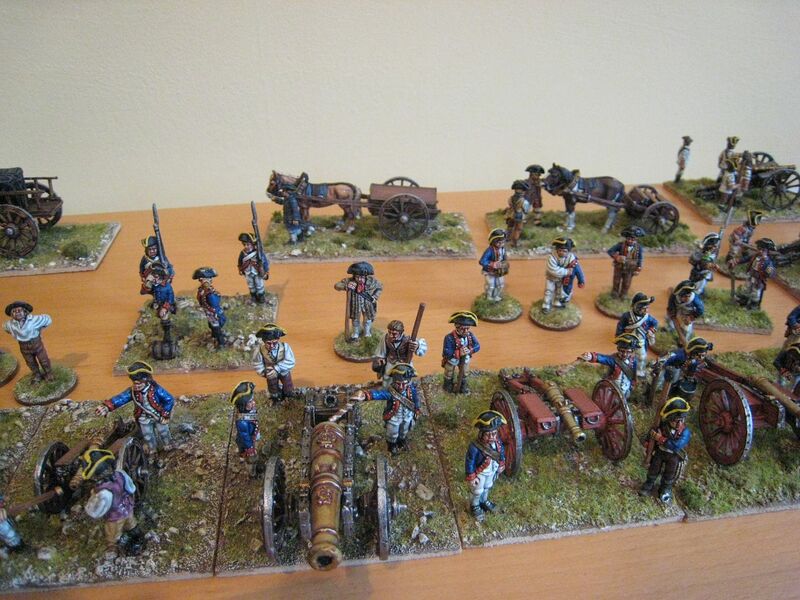 Most of the guns/crew were painted a few years ago, when I first started out with the AWI; the crews are the various Foundry packs mixed together. Those earlier guns need some work and the crews are a bit glossy. 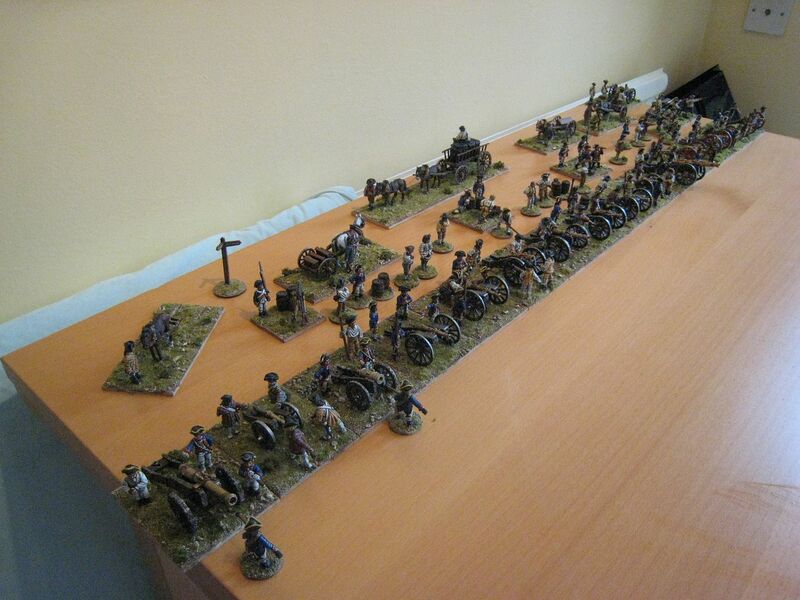 But en masse I think the set-up looks ok. 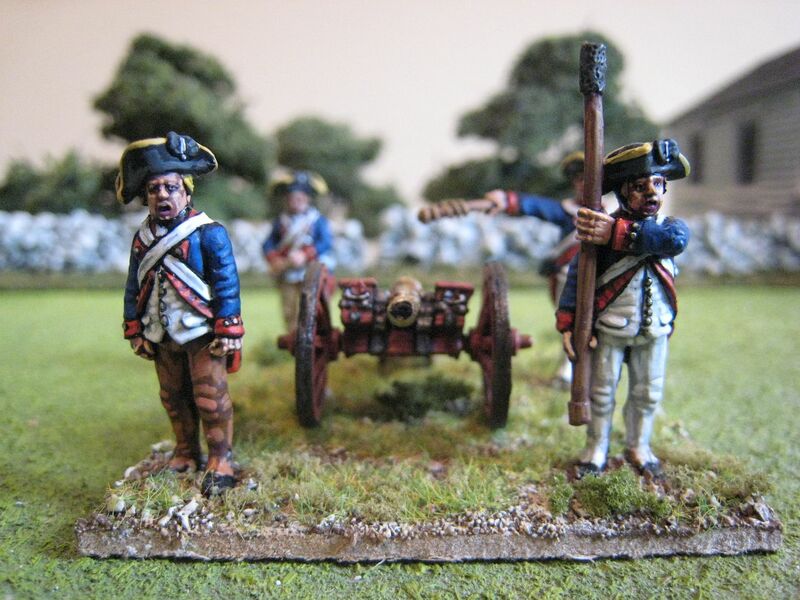 The Perry "add-ons", like dragrope men and the ammunition carts etc do bring the battery to life. There are a couple of Old Glory fogures too, on the battery commander command stand in the centre. 8 figures and 2 guns. Painted January 2011.